"In Public Space We Trust: Spettacolo Collettivo Per La Costruzione Di Una Nuova Citta"
Esterni is glad to invite you to take part in a collective performance for the overturn of the village of Favara and the creation of a brand-new and compelling urban order. 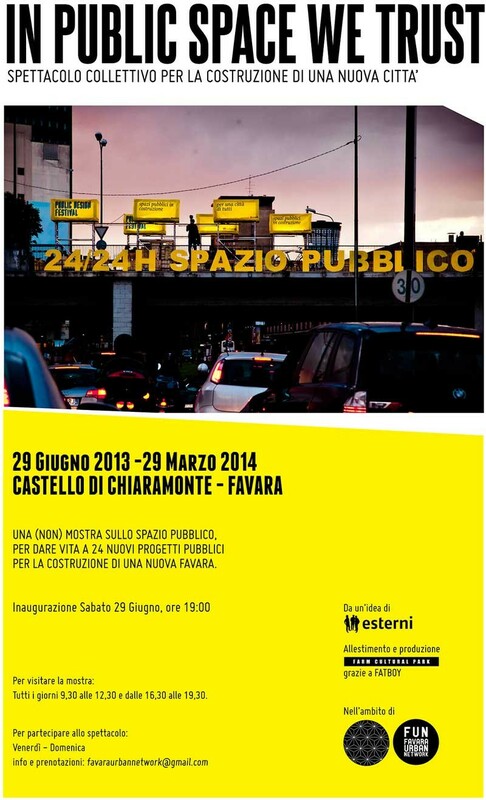 From 29 June 2013 to 29 March 2014 visitors will be asked to play actively the role of inventor of public spaces, getting inspired by the many examples of projects and urban interventions collected in publicdesignfestival’s tumblr and displayed inside the Castle of Chiaramonte. The project is designed with the complicity of F.U.N. - Favara Urban Network. UNSTABLE participates in the exhibition with the presentation of "YOUR TEXT HERE", performed in Detroit in October 2012.